Smith sits third to the left of Root. Root plays with Adidas bat. Only two people sit between Williamson and Vacant seat. Vacant seat of row-1 does not face Root also does not sit at any of the extreme ends. Williamson neither plays with Puma bat nor MRF. Warner does not sit adjacent to Quinton. The one who plays with a SS ton bat is Kohli. The one who plays with MRF bat faces the one who plays with Reebok bat. The one who plays with Reebok sits third to the right of the one, who sits opposite to Root. Warner is not an immediate neighbour of De villers. Guptill, who uses the bat of neither Puma nor SC Cobra,does not face vacant seat. Neither Root nor Smith sits at an extreme ends. Vacant seats are not opposite to each other. Two persons can sit between Warner and Kohli, who sits third to the right of the one, who plays with a Kookaburra bat. The one who plays with Spartan bat faces the one, who plays with Adidas. The person who plays with Gray Nicolas and Reebok are adjacent to each other. Vacant seat of row-1 is not an immediate neighbour of De villers. Williamson sits at one of the extreme ends. Kohli uses the bat of neither Gary Nicoles nor Reebok. 1. Who sits second to the right of the one, who faces vacant seat of Row-2? 2. Which of the following is true regarding Babar? a) Babar sits second to right of Guptill. b) Babar is not an immediate neighbour of Root. c) Babar sits third to left of Smith. d) Babar sits at one of the extreme ends of the line. e) Babar faces vacant seat of row-1. 3. Quinton is related to vacant seat of row-1 in the same way as Babar is related to Guptill. So, following the same pattern vacant seat of row-2 is related to which of the following? 4. Who sits diagonally opposite to the one, who plays with SC Cobra Bat? 5. Which of the following bat does Guptill play with? Woodland, Nike, Puma, Adidas, Reebok, Bata, Leecooper, Hushpuppy are family persons and sitting around a table not facing outside the centre. There are three female members and couples as well. Leecooper is third to the right of Puma. Hushpuppy, a nephew of Woodland, is sitting second to the right of Puma. Woodland’s father and mother are his immediate neighbors, while his brother is second to his right. Bata, who is Woodland’s uncle, is sitting to the immediate right of Woodland’s wife, but he is not facing Woodland. Reebok, who is the wife of Woodland’s brother Nike, is sitting second to the left of Woodland. Reebok is not the immediate neighbor of her mother in law. 6. Who is sitting third to the left of the Husband of Puma ? 7. If counted clockwise from Leecooper, how many people sit between Woodland’s wife and his sister-in-law? 8. Which among the following statement is false regarding Woodland’s relation with his family? 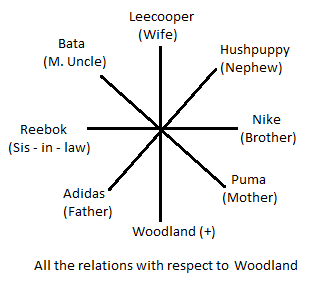 a) Reebok’s mother-in-law is the wife of Woodland’s father. b) Leecooper is the daughter-in-law of Woodland’s father. c) Hushpuppy is the son of Woodland’s mother’s grandson. d) Hushpuppy’s mother is the daughter-in-law of Woodland’s mother. e) Nike is the father of Woodland’s nephew. c) The grandson is sitting second to the right of the grandmother. 10. How is the person who sits third to the left of Woodland, related to Woodland? P, Q, R, S, T, V and Z are seven employees of call center. They work in three shifts – I, II and III. There is at least one and not more than three among them in any of these shifts. Each of them get one day off in every week from Monday to Saturday. Q works with only T in shift II and his weekly off is immediate to the next of the off day of P. S has weekly off on Sunday and he is not in the same shift with either R or Q. P is in shift I with R whose off day is immediately after Q and immediately before T. V’s off day is immediately after T but not on Saturday. The employee having off day on Friday works in shift III and that on a Saturday does not work with T. Z does not work either in shift II or in shift III. 11. In which shift do three of them work? 12. On which day of the week does Q have off day? 13. Which of the following combinations of employee-off day-shift day is not correct? 14. Who among them has off day immediately on the next of V’s off day? 15. In which shift does V work?